As a member of the TCU Horned Frog Marching Band, you’re a part of an exciting and spirited group. Many members cherish lifelong friendships and the instant support network you gain when you step foot on campus. Drawing students from almost every field of study, the band is one of the most visible and prestigious organizations on campus. Thanks to TCU’s membership in the Big 12 Conference, the Horned Frog Marching Band performs for crowds of almost 200,000 fans in an exciting football atmosphere throughout the fall. All TCU students are eligible to join the marching band. This program enlists nearly 200 students of varying degrees of talent and differing musical interests, boosting their careers and vocations in music. Members are paid a stipend for participating. The band performs at all home football games, several away games, guest exhibitions at marching festivals, at pep rallies, other campus functions, the Fort Worth Stock Show Parade and bowl games. Students participating in the TCU Marching Band will receive a $3,000 scholarship during the fall semester in which they participate. While Marching Band is a fall semester course, all members are encouraged to enroll in one of the three concert organizations that meet in the spring: The Wind Symphony, Symphonic Band and University Concert Band. The Wind Symphony and Symphonic Band also meet during the fall semester, and marching band members are encouraged to participate. Several outstanding jazz ensembles, along with the TCU Basketball Band, are also great musical opportunities at TCU. 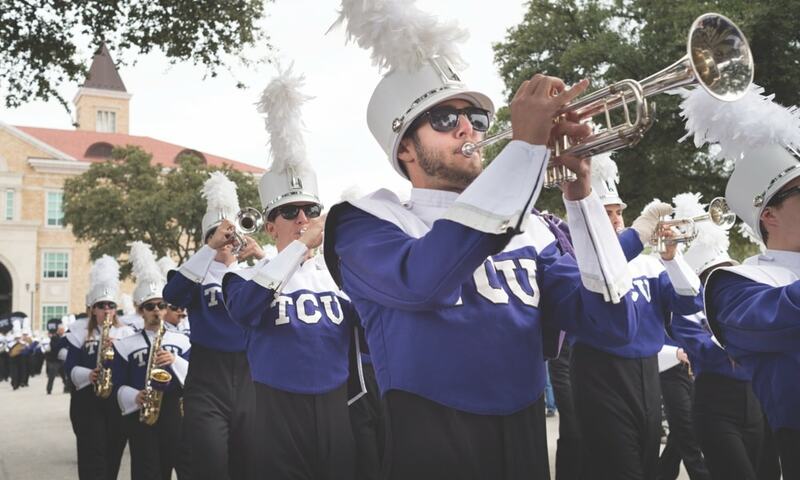 Read TCU Magazine’s article about the marching band. The TCU Colorguard adds pop, color, drama, and an expanded visual component to the Horned Frog Marching Band. We welcome a wide range of talent and skill and do not require any previous colorguard experience. There is a short two day audition process to be placed on the TCU Colorguard. The audition checks basic skills that are presented in the first day. The TCU Colorguard spins flags, rifle, and saber. For the weapon line, previous experience is typically needed. 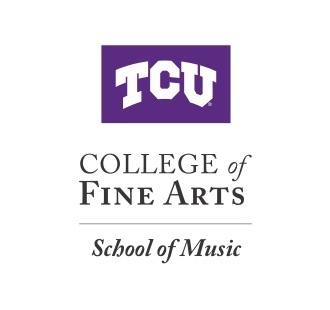 Members are not required to play an instrument for any concert bands but are encouraged to participate in other areas of the TCU School of Music. For those looking to continue their colorguard experience or want to try something new, the TCU Colorguard is a great way to make friends, get involved, and cheer on the TCU Football Team. For further questions about the TCU colorguard please contact the TCU Band Office at 817-257-7640. The TCU Horned Frog Marching Band is pleased to announce an exciting opportunity for college-age musicians in the DFW Area. Registration with TCU Extended Education Program gives participants the opportunity to be a member of the TCU Horned Frog Marching Band while attending another university or community college in the DFW area that does not have a marching band where they attend.. Members participate in all the excitement and thrill of being in a Big 12 college marching band without being registered as a full time student at TCU. As a full member of the group, you will get to perform at all home and regional TCU football games, pep-rallies and travel with the band to support the team at bowl games and special exhibitions. $250 is the only fee required for the course and covers travel, meals, and gear during the season. To accept our invitation to play with the TCU Horned Frog Marching Band, email s.owens@tcu.edu for more information or call 817.257.7640. Camp is scheduled from August 13 to August 19. To participate, incoming freshmen register for the course during summer orientation while current students can register during standard course selection. All marching band members should plan to attend Horned Frog Summer Band Camp the week before school starts. For more information you can contact Sharie Owens at 817-257-7640.